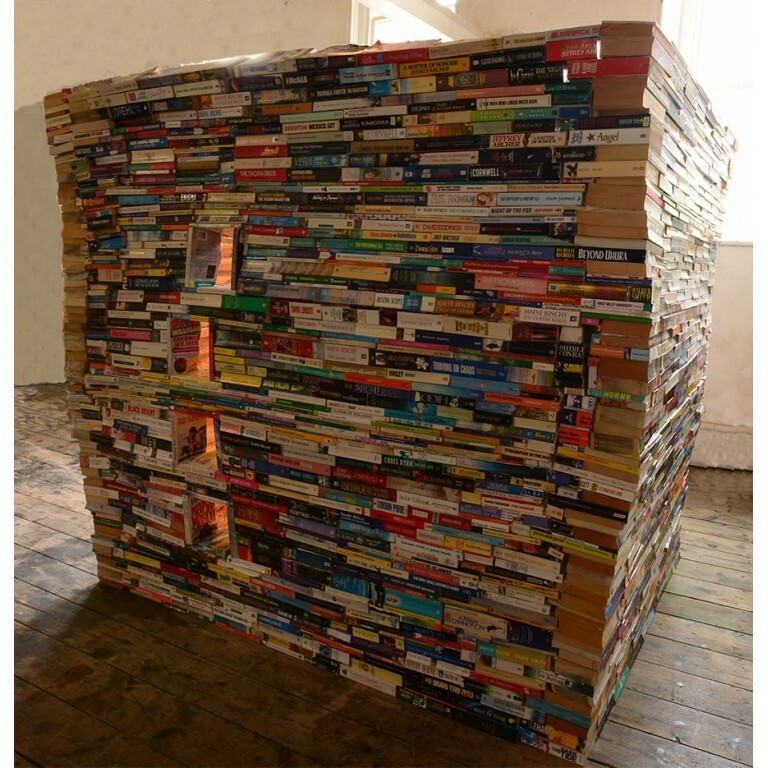 This recycled installation is made from paperbacks, mainly romantic novels, that have titles like Confessions of a Vicar’s Wife and Cold Heart Canyon. They have been formed brick-like into a rectangular tower which stands about 1.82 metres high. In it are regular shaped windows on two sides which allow a view into the interior. The titles of the books are visible on the outside of the walls, and looking through the windows people can see the pages of the books have been roughly carved – softened – so that they may look a bit like flat pieces of stone or an ancient ruin. Living in Central London, we all live in or walk past huge tower blocks every day. But what do we know of the lives of all the people who live in the flats? Peoples complicated lives in which so much joy and sorrow and so many major and minor events are contained. References to archaeology run right through my work, also the act of looking through and beyond surfaces. Sometimes there may be a link formed between the present and contemporary life and the distant past. Romantic and other paperback novels. Location: Shown at the Nettie Horn Gallery, Vyner Street, London E2.